Do you know when was the first time Mahatma Gandhi was mentioned in Australian Newspapers? By admin on March 31, 2018 Comments Off on Do you know when was the first time Mahatma Gandhi was mentioned in Australian Newspapers? Mahatma Gandhi’s life as an activist began at the age of 23, when he landed in South Africa as a barrister. There were many Indian Coolies and immigrants in South Africa working for the British Empire at that time. But being a Barrister, Gandhiji commanded respect as a leader of the Indians. The non-violent nature of his agitations, which is called Satyagraha, caught the attention of the administration right from the beginning. Even the Australian Newspapers, reported Gandhiji’s activities with due respect and admiration. The first News item about Mahatma Gandhi appeared in “Evening News” published from Sydney on 8th January 1897, four years after Gandhiji arrived in South Africa. The same news was reproduced in other Major newspapers of that time in the days followed. Gandhiji was a young man of 27 years at that time. On the determination of the people of Natal to prevent Indian coolies from landing, the’ Madras Weekly Mail ‘ throws some light. It appears that the cause of the Indians in Natal has lately been taken up by a countryman of theirs, Mr. Gandhi. Says the Mail ‘ of November 12, A ‘correspondent writes: It was not necessary to attend the public meeting held in Madras last week or to read Mr. Gandhi’s pamphlet to know that the Indians in South Africa suffer under a real grievance. The story of the Indians in Natal is the story of the African in the United States, of the Chinese in the United States, and of the Kanaka in Queensland. ‘ They came to Natal in the first place as coolies and as coolies did great things for Natal at a time when the European could do little and the Africans would do nothing. Yet when any of these races has attempted to claim the same rights, and exercise the same privileges as the Europeans around them, there never has been any doubt as to the answer which – they received and that even in the most democratic communities in the world. The principle which underlies Mr. Gandhi’s appeal (for equal privileges for his countrymen) will find a very wide assent, but that assent will be more certain in Great Britain than in her colonies. Suppose, for the sake of argument, that there suddenly ‘happened to Great Britain an enormous influx of Asiatics, an influx so great that all the retail trade and email handicrafts fell into their hands, and the man who now -strikes on thirty, shillings a week saw’ his work taken by a Chinaman on ten shillings per month. Would the English democracy hold forth the right hand of fellowship to these immigrants? Would the ‘Times’ advocate their admission to the franchise? England knows that she has nothing of the kind to fear, and therefore Mr. Gandhi may be sure that he will receive considerable support not merely from philanthropists but from a very large body of the public who are in no sense of the word faddists. The report goes on addressing the issues faced by the Indian community in South Africa. Gadhiji’s pamphlet addressing the grievances and ill-treatment of Indian in Natal made references in Australian News Papers whenever the plight of South African Indians were reported here. Along with Mahatma Gandhi, another Gandhi too found mention in Australian Newspapers at that time. He was Virchand Gandhi, the Jain Preacher. After 1897, Gandhiji was widely reported in the World News section of Australian Newspapers from 1907, when the Asians protested against the Asiatic Registration Act of Transvaal, in which Gandhi was the leader of the Indian agitation. In 1906, The Asiatic Registration Act of the Transvaal Colony was re-established to control Asians (Indians and Chinese) in South Africa, by having them officially register and provide important personal identification. This was the first time Mahatma Gandhi used “Satyagraha” as a tool against the British. Gandhiji urged Indians in South Africa to defy the new law and suffer punishment rather than resisting it with violent means. 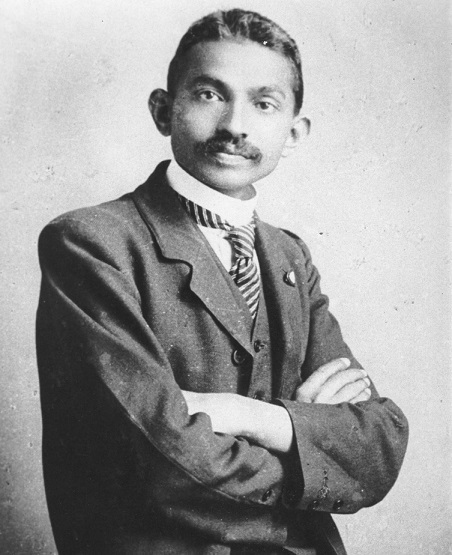 Gandhi, along with hundreds of his Indian followers, were imprisoned for their disobedience against the Asiatic registration act and one day Gandhi was pulled from prison to negotiate with General Jan Smuts. After much disagreement, Gandhi and General Smuts were able to reach a compromise. “Gandhi promised to end the Satyagraha if the “Black Act‟ was repealed and the prisoners released, and Smuts agreed to do this provided the Indians would register of their own accord. Gandhiji was mentioned twice in the article. To the colonial public this agitation appears to be largely the result of up exaggerated sentimentalism. The Indians agreed to voluntary registration in Lord Milner’s time. They gave their thumb impressions; and Mr Gandhi, the life and soul of the passive resistance movement today, was the first to place his thumb on the paper. But to-day they object to give ten finger impressions when called upon to do so by act of Parliament— though they agree to do so voluntarily even now. There is no necessity for barrister of the Inner Temple, like Mr Gandhi, to give his finger prints; though there is a very good reason. why Ram Sammy, the coolie fruit hawker, should give his finger impressions, in order to distinguish him from a score of other Ram Sammys, all alike as two peas. I am assured that the Transvaal Government was agreeable to this, and that the exemption of the educated Asiatics could have been obtained. But the leaders of the British Indians objected. They laid down the principle that, all must be. treated alike. They insisted upon the barrister being placed on a level with the hawker. The principle of exemption for educated people is admitted in native legislation, and is indeed the. only, method by which the coloured races can, be fairly governed. But the Asiatics would have none of it. Since 1907, Gandhiji’s activities were widely reported in the world news section in Australian Papers about his involvement in the agitation against the Asiatic Registration act. The Newspapers published Gandhi’s imprisonment, his speeches and the negotiations he had with the British Government on Asiatic Act. Mr. Gandhi, a barrister, secretary of the British Indian Association of the Transvaal, who has been ordered to quit country within 48 hours, made a speech recently on the Rand, in which he remarked that the -British Government must choose between India and the colonies. The London Daily Telegraph, in reply, admits Gandhi’s eloquence, but declares that he is wrong. “We are not going to coerce our white dominions not evacuate India,” says The Telegraph. Counsel engaged by the Indians, who have been ordered to leave tile Transvaal, declare that the Transvaal Government is only empowered to send Indians to the border, not to -place them over the border. Mr. Gandhi is a man who is marked by his simplicity of attire and modest demeanour. A short, slight figure, with iron-grey hair, his whole attitude is the embodiment of gentleness and courtesy. Above all things, he is an apostle of peace. “From the day when he was kicked on to the floor of a mall coach by a burly Dutchman who wanted his seat until that day only a few years ago when he was marched through the streets of Johannesburg in company with a chained, gang of dirty Kaffirs and was afterwards herded in a cell with Chinese of the lowest order, this refined gentleman has been treated in a way that seems incredible when, we realise. that he was a member of the London Bar. “In his. private life Mr. Gandhi tries as far as possible to adhere to the ideals of Tolstoi. He has a refined wife and two or three children who are ail fully determined to suffer with their father. He comes from an old Indian family.” This is the man who has been sent to prison for twelve months for protesting against an unjust poll-tax of £3 and against free movement from State to State.